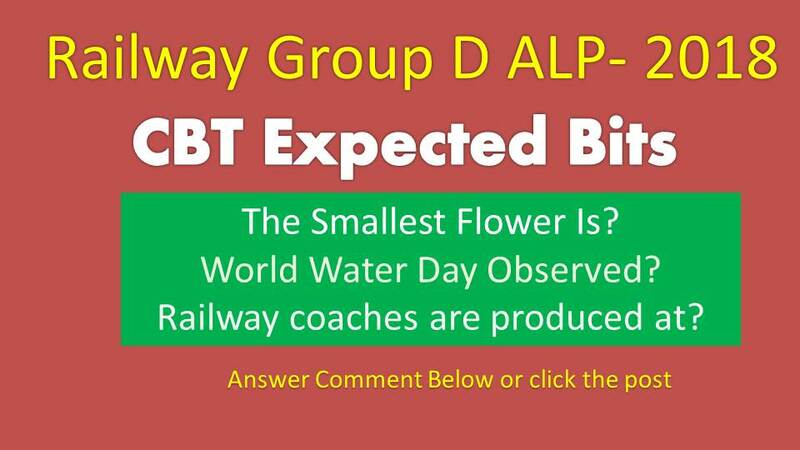 Railway Group D ALP Expected Bits 2018: Hi Viewers welcome to our portal ssc-ibps.com, in this article we are providing the important repeated question in Railway Recruitment Board Examination like as Assistant Loco Pilot, Group D and Other Examinations. in the year 2018-19 Indian Railway Recruitment has released more than 1 lakh railway posts in different notification. For all notification examination pattern and syllabus are mention in previous articles. This article given the most Important expected questions in Railway exams these bits are useful for preparation. 1. The Constitution of India came into force with effect from ……………..
2. Where and when was the Ghadar party founded? 3. New York is situated on the river? 5. The Smallest Flower Is? 7. Which vitamin is considered to be a hormone? Explanation: Note: Vitamin D is actually a hormone rather than a vitamin. The body makes most of the vitamin D it needs; only about 10% comes from our food. The action of sunlight on our skin produces a substance called cholecalciferol, which is converted by the liver to calcidiol. 8. What is the slogan of Indian Railway? 9. Who wrote the book "Indian War of Independence”? 11. Which hill station’s name means ‘place of thunderbolt’? 12. What is the chemical name of Tear Gas? 14. Which country is known as `Cockpit of Europe`?